We found it clean,bedding changed once and towels changed twice. Nice swiming pools sadly on the saturday night some threw a fire exstinuser into the paddling pool. The lifeguard and handyman spent all day emptying and refilling pool. Hand shopping complex next door. the web page shows 4 star accommodation, never even a 2 star, a dirty drab, dingy place, the rooms, around the pools, disgraceful. sheets changed once during a two weeks stay, towels changed twice. we have stayed in a few apartments on this complex, and we have found that if you hire a privately owned apartment, they are a lot better than the standard complex ones, as the owners have given them a face lift, we lasted stayed in apartment 119 and found this has more inside, like a full size cooker with oven, it has a fridge freezer, a double bed in the bedroom, patio arm chairs you can site with your coffee or breakfast, the apartments are also better equipped, we also had a 24 hour contact number, so we felt better than just having a reception, altho reception is open until midnight. So check the details of the apartments if you can, as they vary so much, and also some are not in a very nice location on the complex. This hotel was the best value for money I have ever stayed in. The room was very clean, the beds were made and towels changed every 3 days. The hotel bar/restaurant provided great meals at value for money prices with very pleasant staff. The swimming pools were large with lifeguard and very clean. The grounds within the complex were very well maintained. The hotel staff were all very polite and helpful. The room had tv with sky news, +spanish channels. It is about a 5 minute walk on the flat to the main beach and resort centre. The cleanliness of these apartments was of a high standard the 3 pools were very clean and the gardens were well maintained. There was a small pool bar selling snacks and a Sunday lunch which was a barbeque and lunch for 5 euros very good value. The apartments were very quiet and relaxing, I think most of the apartments are now privately owned. The apartment was in a great location only 5 mins to beach and 10 mins to centre where there are an abundance of restaurants, bars etc. The commercial centre being built next door looks as though it is almost finished, this will be handy as there will be a supermarket, bars etc there. I would certainly go back to these apartments. Not long back from these apartments. These apartments are now almost all privately owned therefore was nice and quiet laid back atmosphere. The pool and gardens are very nice and very clean. Although there wasn`t any entertainment all amenities are a short walk away, as the beach is. The new waterpark and theme park which is great for kids is only 5 minutes walk. There is a small pool bar which is very friendly. The new commercial centre which is due to open Christmas 2006 has supermarket, bars restaurants ect is literally next door. I will certainly be going back to these apartments. We booked this apartment privately via the internet. The hotel grounds were clean, all though the bins around the pool did tend to overspill before they were emptied. Apartments are basic but adequate although a bit difficult to cook properly for a family of 5 with just a microwave and 2 rings, the balcony was very large. As we booked privately we had to pay separate for cleaning. We paid 60 euros for a week, but only seen the cleaner twice although we were told she would come every other day. The reception is advertised in some information as being 24 hours but it was no where near this. As for staff we only really saw the lady in reception and the people who run the bar, but they were all really nice and friendly. Entertainment is non existent apart from a TV in the pool bar. The pools are lovely and not cold, it was so quiet that we quite often had the pool to ourselves. The location is great only a 10 min walk to the town centre, beach and water park. Given the location, the lovely grounds and the 3 lovely pools I cannot understand why the place was so quiet. But we were told that a lot of the apartments are residential, maybe thats why. Building work behind the hotel did not bother us at all. No problems with adjacent building site. They do start early, 7 a.m., but only background noise, and as there is building going on all over Corralejo, it is just accepted. The Atlantic Garden is really spacious. The two pools very clean but cold, and plenty of sunbeds. Never ate in restaurant at night as it did not advertise itself, but there were plenty of people having bar snacks. We had a cooked breakfast on our last day - great value for 5 euros. Apartments really spacious - cooking facilities limited as no oven or grill, but microwave, toaster and kettle supplied so no problems for breakfast or microwave meals. Massive balcony for catching late afternoon sun and drying towels. Very laid back atmosphere. There was an attempt at entertainment, but everyone seemed to go into Corralejo at night for meals. Only a ten minute walk on to main street, 20 mins to start of sand dune beach and then another 30 to 2 hotels with sun loungers and umbrellas for 3 euros each, but bus is only 1 euro, so save your legs! Would recommend apartments for a restful laid back holiday, probably noisier in school holidays, but great for couples early or late season. Our first visit to Atlantic Gardens had great time rooms basic but clean. We had Christmas lunch would not recomend great with children specially reception staff could not do enough for us when lights kept tripping of gave us three diffrent apartments to choose from. 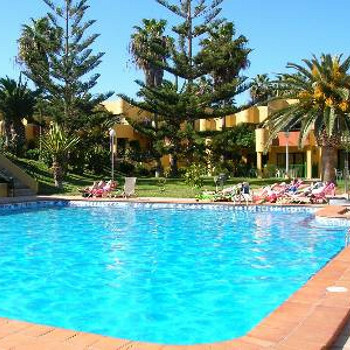 Entertainment could be a lot better but they did try if I went back to Fuerterventura i would stay at aAlantic Gardens. Last year was the second time we stayed there and it was as good as the first time we went. The staff were really friendly and helpful. We love the town,beaches,sun,whole place in fact we are going back this October for 2 weeks again.